Caroline is a Professor of Marketing and Associate Dean for Entrepreneurship at Cass Business School. Caroline’s main research interests lie in the areas of consumer research and new media marketing. She has published in leading academic journals, such as the Journal of Consumer Research, Marketing Science, the Journal of the Academy of Marketing Science, the International Journal of Research in Marketing and the Journal of Interactive Marketing, among others. Her articles have been nominated for and won a number of best paper awards. 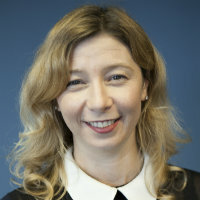 Caroline is a member of the Editorial Review Board of the Journal of Interactive Marketing and Journal of Business Research and regularly reviews for other journals. Caroline teaches Critical Thinking on the BSc in Business Management and Marketing on the MSc in Marketing Strategy & Innovation and the Executive MBA. She also delivers Executive Education and frequently speaks about digital marketing and social media trends. Over the years, she has won many awards for excellence and innovation in teaching and curriculum development. Caroline is passionate about London's buzzing start-up scene and about supporting student and graduate entrepreneurship. In her role as Associate Dean for Entrepreneurship, she looks after City Ventures, the umbrella organisation that develops and delivers all of the university's entrepreneurship activities. She volunteers as a Trustee of the St Martin-in-the-Fields Charity, and its annual BBC Radio 4 Christmas Appeal, which raises money for the homeless in London and people in need across the UK. In that capacity, she is also a founding member of the Frontline Network steering group, developing a supportive community for those at the frontline working with homeless and vulnerably housed people. English (can read, write, speak, understand spoken and peer review), French (can read, write, speak and understand spoken) and German (can read, write, speak, understand spoken and peer review). Campana, M., Wiertz, C., Feiereisen, S. and Bardhi, F. (2016). Money as a Tool for Innovation. Consumer Culture Theory Conference 6-9 July, Lille, France. Campana, M., Wiertz, C., Feiereisen, S. and Bardhi, F. (2014). Counterperformativity of Alternative Exchange Systems, Poster presentation. Consumer Culture Theory Conference Helsinki, Finland. Hennig-Thurau, T., Wiertz, C., Bohnenkamp, M. and Paul, M. (2013). What Drives Consumption and Engagement on Online Media-Sharing Platforms? An Investigation of YouTube. 2013 AMA Winter Marketing Educators' Conference 15-17 February, Las Vegas, US. Campana, M., Wiertz, C. and Feiereisen, S. (2013). Ideology and Alternative Market Systems: The Case of Complementary Currencies. Conference - EPIC - Ethnographic Praxis in Industry Conference London, UK. Bohnenkamp, B., Wiertz, C. and Hennig-Thurau, T. (2012). Consuming 'media trash': When "bad" becomes "good". Association for Consumer Research Conference October, Vancouver. Wiertz, C., Hartmann, B. and Arnould, E. (2011). Practice Consumption and Value Creation: Advancing the Practice Theoretical Ontology of Consumption Community. 39th Annual Association for Consumer Research Conference St. Louis, MO, USA. Wiertz, C. and Hennig Thurau, T. (2010). The Twitter effect: Investigating the impact of real-time electronic word-of-mouth on the success of short life cycle products. 39th EMAC Annual Conference 2010 1-4 June, Copenhagen, Denmark. Wiertz, C., Mathwick, C., de Ruyter, K. and Dellaert, B. (2009). A Balancing Act: Governance in a Virtual P3 Community. The Association for Consumer Research Annual North American Conference Pittsburgh, PA, USA. Wiertz, C. (2008). If You Love Something, Set It Free? Insights Into The "Empowered" Customer. Marketing Congress - Community Marketing Eindhoven, The Netherlands. Wiertz, C., de Ruyter, K., Dellaert, B. and Mathwick, C. (2005). The Drivers and Marketing Implications of Community Citizenship Behavior in Virtual Communities for Service Delivery. 14th AMA Frontiers in Services Conference 6-9 October, Tempe, AZ, USA. Lambrecht, A., Tucker, C. and Wiertz, C. (2018). Advertising to early trend propagators: Evidence from twitter. Marketing Science, 37(2), pp. 177–199. doi:10.1287/mksc.2017.1062 . Marchand, A., Hennig-Thurau, T. and Wiertz, C. (2017). Not all digital word of mouth is created equal: Understanding the respective impact of consumer reviews and microblogs on new product success. International Journal of Research in Marketing, 34(2), pp. 336–354. doi:10.1016/j.ijresmar.2016.09.003 . Gkritzali, A., Lampel, J. and Wiertz, C. (2016). Blame it on Hollywood: The influence of films on Paris as product location. Journal of Business Research, 69(7), pp. 2363–2370. doi:10.1016/j.jbusres.2015.10.005 . Hennig-Thurau, T., Wiertz, C. and Feldhaus, F. (2015). Does Twitter matter? The impact of microblogging word of mouth on consumers’ adoption of new movies. Journal of the Academy of Marketing Science, 43(3), pp. 375–394. doi:10.1007/s11747-014-0388-3 . Stokburger-Sauer, N.E. and Wiertz, C. (2015). Online consumption communities: An introduction. Psychology and Marketing, 32(3), pp. 235–239. doi:10.1002/mar.20776 . Hartmann, B.J., Wiertz, C. and Arnould, E.J. (2015). Exploring consumptive moments of value-creating practice in online community. Psychology and Marketing, 32(3), pp. 319–340. doi:10.1002/mar.20782 . Blazevic, V., Wiertz, C., Cotte, J., De Ruyter, K. and Keeling, D.I. (2014). GOSIP in cyberspace: Conceptualization and scale development for general online social interaction propensity. Journal of Interactive Marketing, 28(2), pp. 87–100. doi:10.1016/j.intmar.2013.09.003 . Gensler, S., Völckner, F., Liu-Thompkins, Y. and Wiertz, C. (2013). Managing brands in the social media environment. Journal of Interactive Marketing, 27(4), pp. 242–256. doi:10.1016/j.intmar.2013.09.004 . Dholakia, U.M., Blazevic, V., Wiertz, C. and Algesheimer, R. (2009). Communal Service Delivery: How Customers Benefit From Participation in Firm-Hosted Virtual P3 Communities. Journal of Service Research, 12(2), pp. 208–226. doi:10.1177/1094670509338618 . Paul, M., Hennig-Thurau, T., Gremler, D.D., Gwinner, K.P. and Wiertz, C. (2009). Toward a theory of repeat purchase drivers for consumer services. Journal of the Academy of Marketing Science, 37(2), pp. 215–237. doi:10.1007/s11747-008-0118-9 . Mathwick, C., Wiertz, C. and De Ruyter, K. (2008). Social capital production in a virtual P3 community. Journal of Consumer Research, 34(6), pp. 832–849. doi:10.1086/523291 . Wiertz, C. and De Ruyter, K. (2007). Beyond the call of duty: Why customers contribute to firm-hosted commercial online communities. Organization Studies, 28(3), pp. 347–376. doi:10.1177/0170840607076003 . Wiertz, C., de Ruyter, K., Keen, C. and Streukens, S. (2004). Cooperating for service excellence in multichannel service systems - An empirical assessment. Journal of Business Research, 57(4), pp. 424–436. doi:10.1016/S0148-2963(02)00276-X . Wiertz, C., Lambrecht, A. and Tucker, C. (2014). Should You Target Early Trend Propagators? Evidence from Twitter. Marketing Science Institute. Wiertz, C., Ruyter, K.D. and Streukens, S. (2003). Cooperating For Service Excellence In Multi-Channel Service Systems: An Empirical Assessment. Journal of Business Research, Member of Editorial Board, 2016 – present. Journal of Service Research, Referee, 2016 – present. Journal of Interactive Marketing, Member of Editorial Board, 2015 – present. European Journal of Marketing, Referee, 2014 – present. Journal of Marketing Management, Referee, 2014 – present. Psychology & Marketing, Special Editor, 2013 – 2015. Psychology & Marketing, Referee, 2013 – present. Journal of Marketing Communications, Referee, 2012. Consumption, Markets, and Culture, Refereee, 2012 – present. International Journal of Research in Marketing, Referee, 2011 – present. Marketing Letters, Referee, 2011 – present. Marketing Letters, Referee, 2010 – present. Journal of Interactive Marketing, Referee, 2010 – present. Journal of Business Research, Referee, 2008 – present. Journal of Service Management, Referee, 2004 – 2009. Track Chair for Social Media Marketing, 46th European Academy of Marketing Conference. (Conference) Groningen, The Netherlands (2017). Session/Day Chair. Special sessions track chair for Social Media Marketing at the 2016 American Marketing Association Winter Educators' Conference. (Conference) Las Vegas, USA (2016). Session/Day Chair. 2016 Consumer Culture Theory Conference. (Conference) Lille, France (2016). Invited speaker. Co-authors: Wiertz, C., Feiereisen, S., and Bardhi, F.
2016 AMA Winter Educators’ Conference. (Conference) Las Vegas, USA (2016). Invited speaker. 44th European Marketing Academy Conference. (Conference) Leuven, Belgium (2015). Invited speaker. Co-authors: Tucker, C., and Wiertz, C.
Track Chair for Consumer Behaviour, 42nd European Academy of Marketing Conference. (Conference) Istanbul/Turkey (2013). Session/Day Chair. EPIC - Ethnographic Praxis in Industry Conference. (Conference) London/UK (2013). 42nd European Academy of Marketing Conference. (Conference) Istanbul, Turkey (2013). 2013 AMA Winter Marketing Educators' Conference. (Conference) Las Vegas (2013). Co-authors: Wiertz, C, Bohnenkamp, B, and Paul, M.
Social Media Thought Leader Summit. (Conference) Munich, Germany (2012). 40th Annual Association for Consumer Research Conference. (Conference) Vancouver, CA (2012). Invited speaker. Paper: Consuming Media Trash: When "Bad" can be "Good"
Co-authors: Wiertz, C; and Hennig-Thurau, T.
6th Consumer Culture Theory Conference. (Conference) Evanston, IL, USA (2011). Invited speaker. 39th Annual Association for Consumer Research Conference. (Conference) St. Louis, MO, USA (2011). Invited speaker. 39th European Academy of Marketing Conference. (Conference) Copenhagen, Denmark (2010). Invited speaker. 32nd INFORMS Marketing Science Conference. (Conference) Cologne, Germany (2010). Invited speaker. The Association for Consumer Research Annual North American Conference. (Conference) Pittsburgh, PA, USA (2009). Invited speaker. 31st INFORMS Marketing Science Conference. (Conference) Ann Arbor, MI, US (2009). Invited speaker. The Information Society Network - Regulatory Norms and Business Practice in Virtual Worlds. (Workshop) University of Exeter, UK (2008). Invited speaker. Co-authors: Mathwick, C, de Ruyter, K, and Deallert, B.G. Marketing Congress - Community Marketing. (Conference) Eindhoven, The Netherlands (2008). Invited speaker. London SoTL (Scholarship of Teaching and Learning) Conference. (Conference) London (2008). Invited speaker. 37th European Academy of Marketing Conference. (Conference) Brighton, UK (2008). Invited speaker. 17th AMA Frontiers in Services Conferenc. (Conference) College Park, MD, US (2008). 16th Annual AMA Frontiers in Service Conference. (Conference) San Francisco, CA, USA (2007). 2006 AMA Summer Marketing Educators' Conference. (Conference) Chicago, IL, USA (2006). 34th European Marketing Academy Conference. (Conference) Milan, Italy (2005). 2005 AMA Summer Marketing Educators' Conference. (Conference) San Francisco, CA, USA (2005). 14th AMA Frontiers in Services Conference. (Conference) Tempe, AZ, USA (2005). 33rd European Marketing Academy Conference. (Conference) Murcia, Spain (2004). 10th Recent Advances in Retailing & Services Science Conference. (Conference) Portland, OR, USA (2003). 31st European Marketing Academy Conference. (Conference) Braga, Portugal (2002). 11th AMA Frontiers in Services Conference. (Conference) Maastricht, The Netherlands (2002). City Unrulyversity: a pop-up education. (2013) The Guardian (newspaper). (2013) The Financial Times (newspaper). The rise of digital marketing. (2013) The Independent (newspaper). Pop along for an education. (2013) The Independant (newspaper). When Twitter makes its nest. (2012) Ecommerce mag. Social cinema, a front row seat for everyone. (2012) Brand E.
Der Twitter - Effekt. (2012) www.fr-online.de (website). Der Twitter-Effekt. (2012) www.berliner-zeitung.de (website). Twitter und Facebook entscheiden uber Erfolg von Kinofimen. (2012) www.speilgel.de (website). Wie Social Media die Kinobranche umkrempelt. (2012) www.wiwo.de (website). John Carter und der Twitter Effekt. (2012) Handelsblatt (magazine). L'effet Twitter bouscule l'industrie du cinema. (2012) Strategies. Twitter peut impacter votre business. (2012) www.e-marketing.fr (website). Twitter peut impacter votre business. (2012) www.ecommercmagt.fr (website). Twitter peut impacter votre business. (2012) www.chefdentreprise.com (website). Industrie du cinŽma: Analyse du ""Twitter Effect"" sur le succ�s des films produits par Hollywood. (2012) www.labourseetlavie.com (website). Hollywood turns to tweet analysis. (2012) www.ft.com (website). LATEST BUSINESS BULLETIN - Film industry shows how tweets influence box office returns. (2012) France24. Las Redes Sociales ofrecen una vision mas precisa del consumidor. (2011) www.cronista.com (website). Hollywood turns to tweet amalysis. (2010) Finanancial Times (newspaper). Consumers key to making business greener. (2008) www.europeanvoice.com (website). Open Season on the web. (2008) The Independent (newspaper). Open season on the web. (2008) www.independent.co.uk (website). Paradox of the online treasure box. (2007) Gulf News. It's a total paradox . . . an absolute treasure box. (2007) Financial Times (newspaper). MySpace, YourSpace: we're all part of the onine business community now. (2007) Times (newspaper).